California Rolls are the most popular and most well known sushi rolls in the United States. 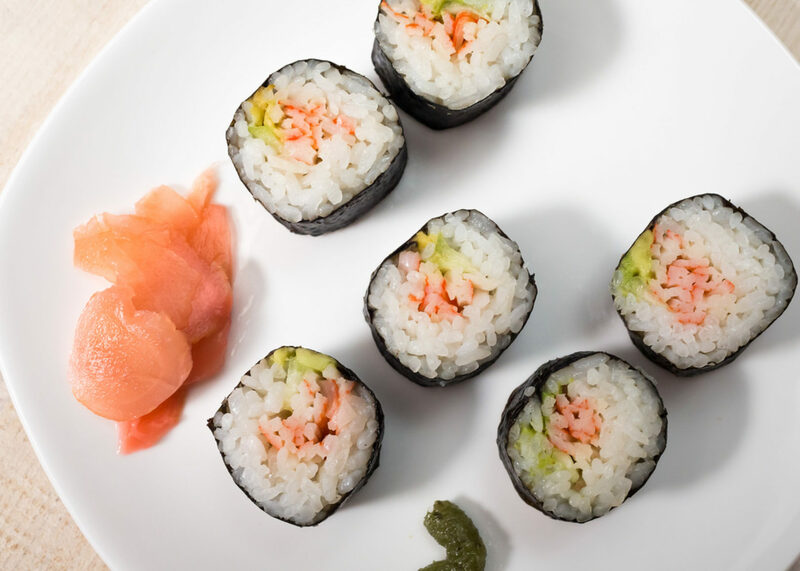 The California Roll isn’t exactly a traditional roll, but I am by no means a sushi traditionalist – I love them! This is (in comparison to some more traditional sushi) one of the milder rolls, which makes it great for those who have never eaten sushi before. This was actually one of the only kinds of sushi I ate all through my childhood, up until a couple of years ago. But beware: if you are allergic to fish, you should use real crab instead of imitation, since imitation crab is made out of fish. Garnish with sesame seeds, and serve with wasabi, shoyu, and ginger (if desired). Enjoy! My gosh, what an elegant blog! This is really sweet design for… really tasty meals! I love sushi, altho I’ve never made it myself. I’m more tempted now, tho Ã¢â‚¬â€ no doubt about that! Your boyfriend has a freakin’ awesome blog too. Style all over… did you design this blog theme yourself? In any case, it’s *SO* complimentary and complementary of your content! You should definitely try the sushi making thing, it’s a lot of fun! Wowza, thanx for your prompt reply, Allison Ã¢â‚¬â€ ooh it highlights your comments too, special! Adding a bit of masago (Flying Fish Eggs) to the mayonnaise gives it a bit of a snap. Also, I find the plain taste of mayo to take away from the taste of the sushi. One of the sushi bars I frequent uses a special sauce made of mayo, masago, and some other ingredients I can’t get out of them yet 🙂 It’s wonderful on baked mussels or in other rolls that require a mayo type sauce. If you were to use real crab instead of imitation, should it be cooked or should it be raw? I live in the midwest and any crab I get isn’t likely to be very fresh. Torley – No problem! The highlighting was Son’s idea, but I really like it too! It makes me feel special 😛 We have never made sushi together before, mostly because he’s always taking pictures of the sushi or working on websites while I’m making it, but we have been talking about making sushi together next time he has some free time. That does sound like a romantic idea, doesn’t it? 🙂 Thanks! Jason – Real crab should be cooked, but when you buy crab from the store they are required to be already cooked, so you just have to crack the leg open and use the meat. Just in case, I did a little research about cooking live crab, and I found this website seems to have good instructions for cooking crab. Hope that helps! Just came by from the lifehacker post and wanted to let you know I love your blog!! Not only is it very informative but also one of the best looking clean design I’ve ever seen. Me and my girlfriend love sushi but don’t always like spending so much money on it. I am very excited to try this out. Keep up the good work!! Is there any substitute for crab? I think here in Brazil the California Roll is made from another kind of fish. If I find out, I’ll let you know. Ulysses – Thank you 🙂 We usually use imitation crab, which is typically made from Alaskan Pollock and processed and dyed to look like pieces of crab. I would love to hear what kind of fish is used for California Rolls in Brazil! In the picture, it looks like you’ve also used cucumber, but its not mentioned in the recipe. Am i right, or are my eyes playing tricks on me. WillTheComputerGuy – Sorry I didn’t reply earlier, for some reason my Spam-Guard accidentally blocked you! That sounds really good, I’ll have to go find some masago now and try that! Thanks! California roll gets a bad rap. To me it’s the hamburger of sushi. Perfect for any casula occasion. Everyone loves the CaliRoll. I don’t use mayo as a matter of fact, but I can’t say I’ve given it a chance. That changes, today. Sometimes a little tobiko on the rice is good though. Thanks for the great site! I found out about it back in November through Lifehacker I think. It inspired me and got me excited about making my own sushi. Over the holidays I received a sushi kit as a gift. Today I made my first attempt at making my own sushi and tried your California roll recipe since it is the roll I am the most familiar with. It was quite a lot of fun to do although there were some challenges along the way. My first roll was HUGE! I clearly overstuffed it with ingredients. The next three I did turned out great in both form and appearance. The last one I made didn’t turn out so well. My cucumber strip got caught up where the nori seal was supposed to happen. It kept a good 40% of the roll from sealing properly. I know that I went too slow in trying to roll it up. However, I’m glad to report that none of this affected the taste of the rolls. They were delicious. And I hadn’t even broken out the wasabi or ginger. Just a quick dip in soy and I gobbled them down. My wife and I shared the pieces that were on the verge of falling apart. Like I said they were delicious. 1) Have you thought about including nutritional info on each recipe? Being the new year and all I imagine some people have made resolutions related to diet/eating habits (like me). I’d like to know the realtive healthiness of each one. Of course, this would be more work for you. 2) Are these recipes generally scalable? As I put together my California rolls I quickly recognized that I was making *a lot* of sushi. Far more than I could eat even with my family’s help. Can I simply cut each ingredient’s size in half for instance. I imagine I could but wanted to ask. 3) Finally, how long does sushi generally “keep” in the fridge? It may take me a few days of meals to get through all I made. Will it be safe for awhile? Again, congrats on the new site and thanks for the inspiration! Sushi will usually keep for about a week, depending on the ingredients you use. If you are using raw fish, then they should be eaten that day as they will go bad and make you sick if you try to store them in the fridge. Most everything else should be alright, although the rice might get a little hard. Just sprinkle a little water on the sushi and microwave it to soften the rice up after refrigeration. I love CaliRolls and by the looks of the comments here they just make people happy. I just made some tonight for the first time in years. Came out great! I love cucumber in them. Fantastic! Yep, they are delicious… I make them anytime I want some quick sushi. 🙂 I’m glad they came out well for you! Thanks for making this blog about sushi! It motivated me to try making my own sushi for the first time on Thursday, and it was such a success I made some more on Friday night! Who knew it could be so easy and so delicious to make at home. Looking forward to more new recipes! Have you ever heard of the Hawaiian roll? Fantastic! I’m so glad that you enjoyed your sushi-making experience! I have not heard of the Hawaiian Roll, what’s in it? Dear Allison: I would like to kwow how much mayonaise you may recomend to add in the crab mix. Let’s say that I am trying to make a 250 to 300 grams of imitation crab meat to use it in to the Caliroll. Any brand suggestion?